On November 20, 2015, the U.S. Court of Appeals for the District of Columbia Circuit rejected the Federal Energy Regulatory Commission’s (FERC) holding that Federal Power Act Section 7(a) limits the municipal preference in original licensing for hydroelectric projects to municipalities located “in the vicinity” of the project site. Western Minnesota Municipal Power Agency, et al., v. FERC, No. 14-1153 (D.C. Circuit Nov. 20, 2015). The underlying orders, which awarded a preliminary permit to a non-municipal competitor based on the results of a random drawing where the competing applications had the same filing date and time, departed from many decades of practice in which FERC applied the municipal preference to all municipalities without regard to their geographic proximity to the project site. The Court held that Section 7(a) unambiguously requires FERC to give preference to States and municipalities over non-municipalities, as long as their applications are equally well adapted to development of the region’s water resources in the public interest. It also held that FERC’s justification for its decision—a policy preference—could not overcome the plain language of the statute. The Court suggested that if FERC is concerned that granting the license or permit to a distant municipality would have undesirable consequences, it may address that through the “equally well adapted” provision of Section 7(a). On November 9, 2015, the U.S. 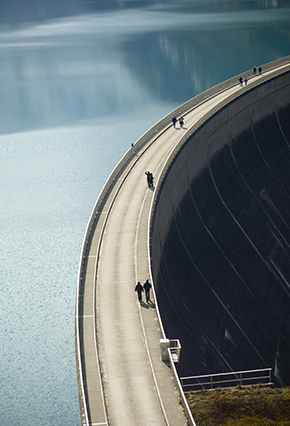 Corps of Engineers (Corps) released a Guidance Document to expedite hydropower development at non-powered Corps dams under Section 1008 of the Water Resources Reform and Development Act of 2014 (WRRDA). The WRRDA directs the Corps to expedite regulatory approval of non-federal hydropower development at Corps facilities and requires the Corps to submit biennial reports to Congress on its initiatives to encourage such development. Non-federal hydropower development at non-powered Corps dams involves three regulatory processes: FERC licensing, a Corps permit under section 404 of the Clean Water Act, and the 408 approval process (permission to modify a dam under Section 14 of the Rivers and Harbors Act). The November 9 Guidance directs each of the Corps’ Major Subordinate Commands (MSC) that operate non-powered dams or other facilities with the potential for generating hydroelectric power to appoint a FERC Coordinator to serve as the point of contact for all FERC hydropower related activities. The FERC Coordinator will work with the District 408 coordinator to ensure timely completion of the 408 permitting process. The Guidance Document also directs each MSC to report on non-federal hydropower activities in its division and the processing time for all regulatory approvals for these activities. The first MSC reports are due on January 1, 2016, and the Corps will rely on these to develop its first biennial report to Congress due on June 10, 2016. In addition, the Department of Energy, FERC, and the Corps will hold a public workshop on December 10, 2015 at 1 pm (Eastern) at FERC headquarters to discuss opportunities to improve coordination of regulatory approvals for hydropower development at non-powered Corps dams. In 2011, FERC and the Corps revised an interagency Memorandum of Understanding and committed to develop more specific guidance on coordination of the agencies’ regulatory responsibilities. Following up on that commitment, the agencies have released a more specific guidance document entitled the Draft Interagency Agreement on FERC-USACE Concurrent and Coordinated Processes. The document proposes two regulatory options to coordinate the FERC and Corps regulatory processes. Option A envisions issuance of the FERC license, 408 decision, and 404 permit concurrently, or as close together as possible. Option B envisions sequential issuance of the approvals, with FERC issuing its license first followed by a 408 decision and 404 permit at a reasonable time thereafter. Written comments on the draft proposal are due by December 18, 2015. On November 3, 2015, the White House issued a Presidential Memorandum on the mitigation of development impacts on natural resources, which was followed on the same day by an announcement from the Department of the Interior (Interior) establishing a new agency policy regarding landscape-scale mitigation. The Presidential Memorandum instructs Interior, the Department of Agriculture, the Environmental Protection Agency, the National Oceanic and Atmospheric Administration (NOAA), and the Department of Defense to adopt a “clear and consistent approach for avoidance and minimization of, and compensatory mitigation for, the impacts of their activities and the projects they approve,” and provides for individual agencies and departments to issue guidance and implementing regulations to effect the policy. FERC’s Office of Energy Projects’ Division of Hydropower Administration and Compliance (DHAC) recently issued an updated Compliance Handbook to provide guidance to licensees, applicants, stakeholders, and FERC staff on FERC rules, policies, and programs designed to address compliance with hydropower license conditions. The Compliance Handbook includes a general overview of DHAC, as well as sections on DHAC’s: reactive activities, such as issues of non-compliance; preventative strategies, such as environmental inspections; and proactive strategies, such as shoreline management programs. It also includes a description of DHAC’s suggested contents of an application for non-project use and occupancy of project lands and waters, an issue not specifically covered in FERC’s regulations. On November 17, 2015, the House of Representatives Committee on Natural Resources released its Federal Footprint Map. According to the Committee, the Federal Footprint Map details the scale of federal land ownership and regulation in the United States. The interactive tool gathers data from federal agencies and is meant as an educational resource for Members of Congress and their staff, reporters, and the public. As noted on the website, the Federal Government currently owns 640 million acres in the U.S. and the land, both onshore and offshore, is owned and managed by almost a dozen different federal agencies. The tool may be helpful to existing and potential hydropower developers in order to ascertain the federal ownership and management of project lands.